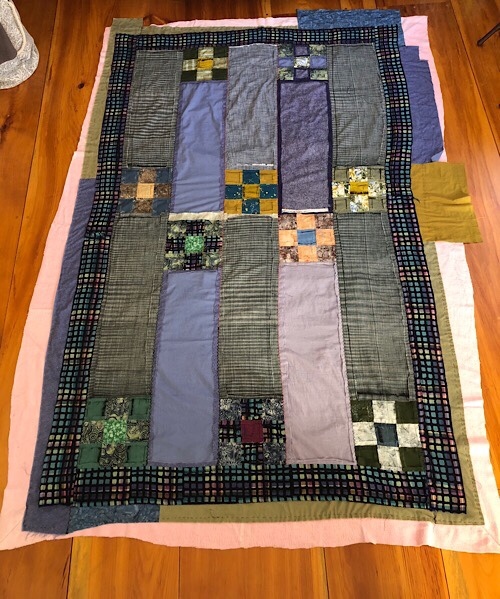 The quilt sandwich – almost finished basting. I’m being much more careful than usual because I know this is going to be tricky. Established that initial two-layer sandwich should be the interior cloth on the bottom, overlaid with one of the pieced cloths, right side facing up. First I had the smaller pieced cloth laid on the interior cloth. Then realized I should have the larger one there so I could see the edges of the smaller one when sewing. Started over. Spent a lot of time centering and smoothing the two initial layers. Nothing is “square” so this was a bit of a challenge. Basted the initial two layers all the way around. Then laid on the second pieced cloth, right side down. More centering and smoothing. Ensure the middle layer (pieced cloth) is visible all the way around. Baste down the top layer. I’m taking a lunch break in the middle of this. Rule: do not trim anything until I test turning it inside out and it looks right!